Summon your miniature minecart minion. Best when ridden in abandoned mines and temples of doom. 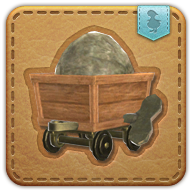 Despite adamant claims by Amajina & Sons Mineral Concern that their donation of over five score carts to the orphans of Stonesthrow was a simple act of charity, opponents of the guild insist it was a scheme to recruit inexpensive child labor for Thanalan's myriad mines. Grants 10 action points to all allies within range who do not have similar actions.